This entry was posted in art, elemental, mindfulness, nature photo, photos, poem, spiritual, verse and tagged art, clouds, Haiku, mindfulness, nature, photography, poetry, sky, sun. Bookmark the permalink. A beautiful aperture to heaven! Spectacular sunburst for Spring ! Yes, perfect, a description of power so beautifully contrasted with sublime simplicity 🙂 Thinking of you as we celebrate the equinox today! Thank you, and wishing you a happy equinox as the light balances. This shot made me think of the incredibly powerful energy of the sun being softened and muffled by clouds…..amazing really! I love to see the shafts of light beaming their way to the earth like that. Happy equinox Seonaid! Really beautiful, both words and photo! Next time send u a pic. by Richard Honan. It’s wonderful to think that we all share the same skies and the same sun….love the thought that you were seeing the same views upwards. 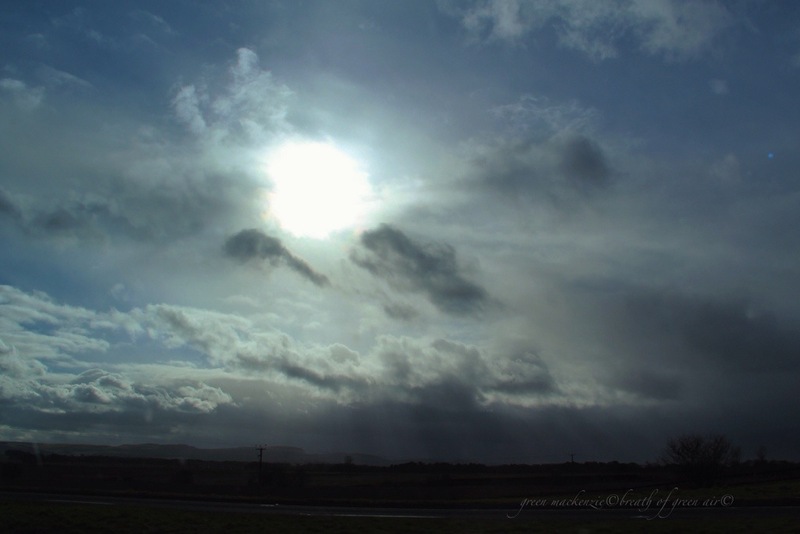 This photo was taken late afternoon towards the west as we drove north towards Perthshire. I recognise that weather – very similar in Dumfries & Galloway this week. I love this silky slightly smothered sunlight…..D&G is another wonderful part of the country….were you golfing?